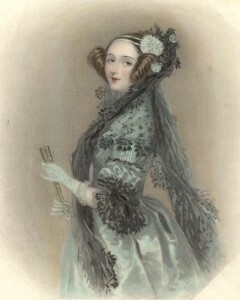 Last week was a celebration of Ada Lovelace Day, which fell on October 15th. The celebrated Victorian mathematician, daughter of the poet Lord Byron, is known as the world’s first computer programmer, and has become a figurehead for women pursing interests in STEM (science, technology, engineering and maths). This has become a day for celebrating female achievements in STEM, but is also used for highlighting the inequalities that many women share in this sector. According to a 2012 European Commission study, out of the 42% of women STEM academic staff in the UK, only 17% of women occupy the most senior research positions. Similarly, according to a 2012 Wise campaign report, the number of STEM jobs in the UK occupied by women stands at only 13%. Research suggests that this declining number is due to ‘the lack of fluidity in the transitional process’ – i.e. although more girls are choosing to study STEM subjects in further education (as well as outperforming boys), they often lack the encouragement to carry on with STEM to higher education and into a career. In honour of Ada Lovelace Day, the popular Everyday Sexism Project invited women to share their good and bad experiences in STEM on Twitter; an overwhelming number of responses voiced experiences in dealing with sexism in the STEM industries. But how are women represented here, at UoN? Certainly compared to other academic institutions, the university seems to have a strong representation of women in many departments. Nottingham’s Hearing Biological Hearing Unit has recently been awarded a Silver Athena SWAN, an award that recognises commitment to advancing women’s careers in STEM academia. The award ‘endorses actions taken to increase the representation of women in science in the areas of organisational culture, work-life balance and career progression of researchers’. Active campaigning by academics, initiatives such as the Athena SWAN and Soapbox Science, an event that promotes the gender equality in STEM, have worked to raise the visibility and representation of women in these fields. By continuing along these lines, it is hoped that other institutions will follow Nottingham’s stead in promoting and encouraging women scientists, engineers and mathematicians, to create positive role models and balance the gender equality scales in the STEM industries.